joy's notepad: Unexpected things happens! Hello everyone! Hope your day has been wonderful. Anyway, Mother's day was celebrated by many yesterday. Although we had it already here in Norway the second Sunday of February, it was heartwarming to receive greetings from friends and loved ones around the world. Today is our day.. but before we became a mother.. u have become our mother. Thank you for all your undying love and support. Though miles keep us apart. . Our hearts won't and will never be. We love you and Happy Mother's day. Happy Mother's Day Ma, we love you! From my second daughter and her family! Well, unexpected things happen, because yesterday, instead of having a nice time with my hubby in the morning, we ended up in the doctor's clinic because of a severe pain in my stomach since Saturday night. But, good thing was it was not serious. He gave me a strong pain reliever and advice me to see my doctor today if I will not feel better. Anyway, yesterday we were invited to a confirmation of my friend's daughter Gina, the youngest in the picture so although I was not really feeling very well, we went. The girl's father passed away many years ago. What so special with Gina was that she was delivered by her father at their bathroom in New Year's day! She couldn't wait for the doctor to come so her father had no choice. But she came out just fine and now a very beautiful young lady. The place was decorated very nicely! And the cakes that were served! I wished I could eat more, but my stomach wouldn't let me. The day turned out wonderfully although unexpected thing happened. The wounds is the place where the Light enters you. Have a nice week ahead friends! Your daughter and her family are all just beautiful!! And what a wonderful and beautiful celebration this was. everything looks perfect! I am so glad you were able to attend, even though you were not well. What did the doctor think it is? Please keep me updated and let me know what happens. How are you now? Thanks Ginny! The doctor couuldn't explain either because he difn't find any serious in me. Maybe stress or bacteria. I am better, but the pain comes and go. I will go to the doctor again if this continues. I managed to work today and that was good. Wala man lang labtest, CBC or urinalysis? Get well soon! But it's March here in the UK. Do take good care dear Joy .. Your photos are so beautiful, Joy! I hope that you heal quickly and that there will be no more pain. I hope you feel 100% very soon. Thank you for sharing those lovely pictures of your family and friends! Thanks Chris and you are welcome! So beautiful! What a wonderful looking family. Great smiles! I'm glad it wasn't that serious, my mother had a similar night but she ended up needed surgery. Though it wasn't that major. Had surgery for the night, came back to the house the next day, and was out of work for a few weeks. Yes, I m glad that it was not serious after all! 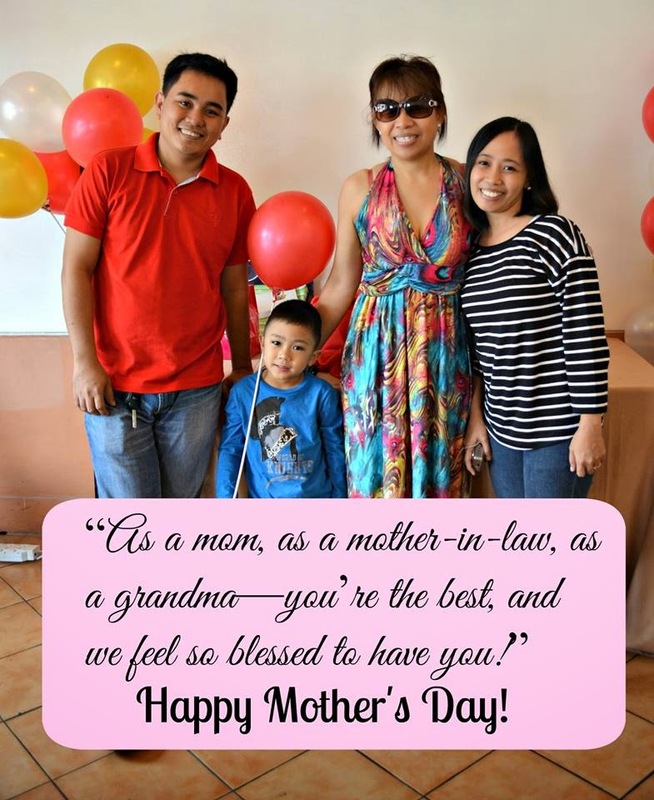 Belated Happy Mother's Day po sa inyo Mommy Joy! Thanks Fiel-Kun for your heartwarming greetings and comment! Thanks Edgar! Have a nice day to you! Looks like a lovely day. Hope you're feeling better now. Thanks Ladyfi. Yes, it was a lovelyd ay for everyone who attend the confirmation! All the picture you have posted tells me how happily you have celebrated the Mother's Day! Thanks Week-end wind up. It ended well, yes! I am hoping you are better now, and that your stomachache is nothing serious! Hug. Thanks McGuffy Ann! I am feeling better now. It was not serious! Hope that you're feeling better Joy. It seems that the day was a success for all. Everyone looked happy and loving. Well done. Thanks Paul! I am feeling better. Yes, everyone was happy in the confirmation day! The beauty in nature and in words! Captions from a road trip! The measure of our worth!